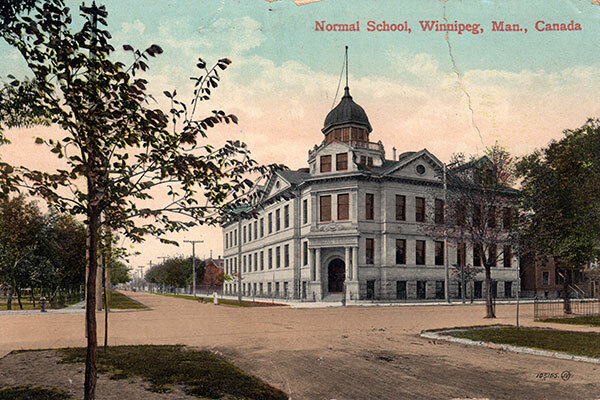 The former Central Normal School at 442 William Avenue in Winnipeg was one of six Normal Schools in Manitoba, along with Brandon, Dauphin, Manitou, Portage la Prairie, and St. Boniface. It served as the headquarters for teacher training for more than forty years. Before its construction, classes were held on the second floor of the vacant Stobart Block on Portage Avenue near Main Street. Constructed in 1905-1906 from plans by provincial architect Samuel Hooper, at a cost of about $100,000, the Neo-Classical structure was made of Tyndall limestone with interior wood work of oak and fir. The basement featured classrooms, recreation room, gymnasium, lavatories, kitchen, and mechanical rooms. On the main floor were classrooms and offices, a model room and library, and large halls. The second floor had more classrooms, laboratory, museum and art room. An apartment of the resident caretaker and storerooms were in the attic. In 1942, the building was taken over by the Canadian military and staff and students of the Normal School moved to temporary facilities near Gimli. In September 1946, the Normal School moved to a facility in southwest Winnipeg then, in the autumn of 1958, it was renamed the Manitoba Teachers’ College. The facility was moved to the University of Manitoba in 1965, becoming its Faculty of Education. 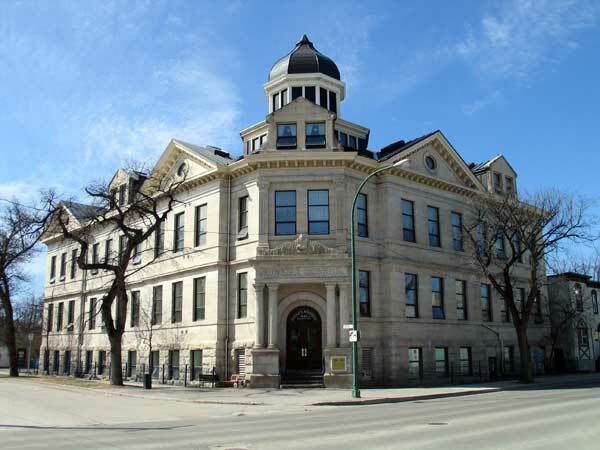 The building was renovated for residential use in 1992, for which it received a Heritage Winnipeg Conservation Award. Two years later, a plaque was placed in front of it by the Manitoba Heritage Council. It is a municipally-designated historic site. “Next Normal School classes to start at Tuxedo Sept. 9,” Winnipeg Tribune, 4 April 1946, page 21. With the West in Her Eyes: Nellie Hislop’s Story by E. W. Nuffield, Winnipeg: Hyperion Press Limited, 1987, page 102. Give Me This Mountain by Mary Kornelsen, Steinbach: Derksen Printers, 1975. Over the Rainbow: Memories of a Country School Teacher by Ruth Emisch, 1993.